Chia seeds might be the tiny cousins of the seed world, but they sure pack one hell of a punch. Like all seeds, chia are high in the good fats. In fact they are the highest plant source of omega-3. They are also high in fiber, low in carbohydrates and contain 15 per cent protein, as well as a variety of vitamins, minerals and trace elements including folate, phosphorous, iron, manganese, copper and potassium. Indigenous to South America, chia was a highly valued crop and a staple food for the Mayans, Aztecs and other Native Americans and used as an energy food for centuries. They are now enjoying something of a resurgence, and are favored by endurance athletes because of their ability to absorb more than twelve times their weight in water. This makes them ideal for rehydration, by replenishing the body’s fluids and maintaining the electrolyte balance. 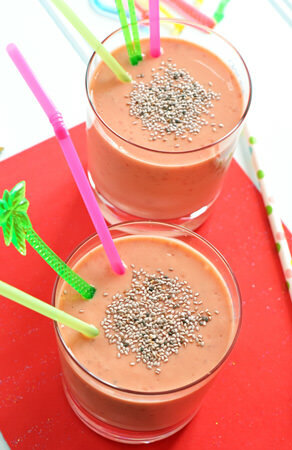 One of the best ways to use them is in a chia seed smoothie. 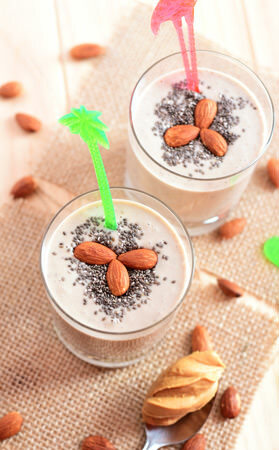 These magic little seeds will enhance almost any smoothie. Because they are almost flavorless, they will go with almost any fruit, but I particularly like them with berries. 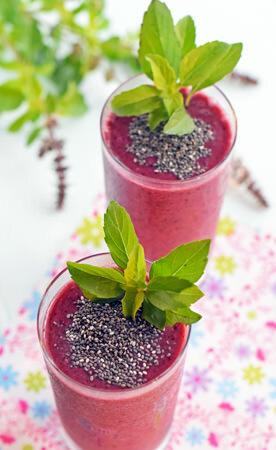 Chia seeds are fully digestible, which means you don’t need to grind them first as you do with other seeds. 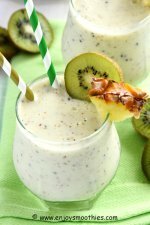 Add dry chia seeds to your blender first, then allow the smoothie to chill for about half an hour while the tiny seeds work their magic. 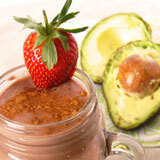 Making the gel beforehand will give your smoothie a smoother texture. But don’t over blend the gel. 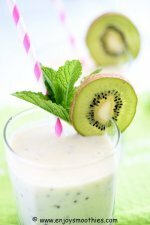 Add the chia gel after the other smoothie ingredients have been blended, then just give your blender a quick whizz to briefly mix the gel. Chia seeds come in two varieties: black and white. The white is produced by selecting white seeds only. Both varieties are the same nutrition wise. Into your blender add the frozen raspberries, frozen mango, yogurt almond milk chia seeds, and honey. Blend until smooth and creamy. Pour into your two favorite glasses and enjoy. 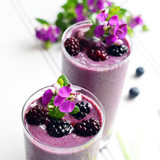 Place the frozen cherries, frozen blueberries, banana, almond milk, chia seeds, dates and honey into your blender and process until you have a smooth consistency. 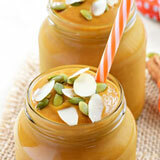 Pour into your favorite smoothie glass and enjoy. 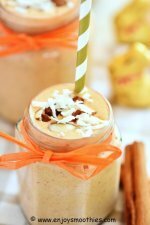 Blend together the bananas, almond milk, vanilla yogurt, peanut butter and chia seeds. Blitz on high until everything is creamy. 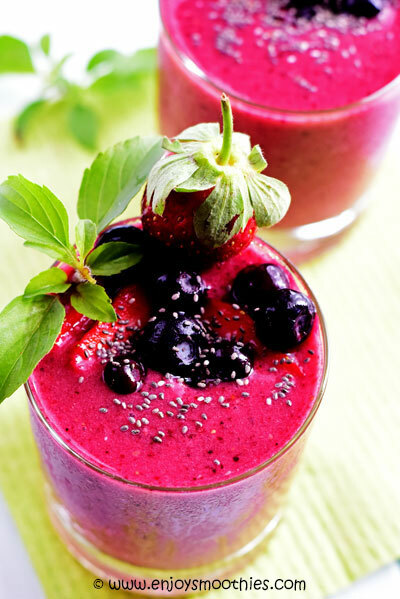 Mix the strawberries, blueberries, banana, coconut water, pomegranate juice, chia seeds and lemon juice together in your blender until smooth. 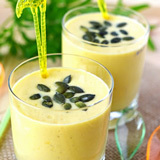 Place the mango pieces, banana, pineapple, almond/coconut milk and chia seeds in a blender and puree until smooth. 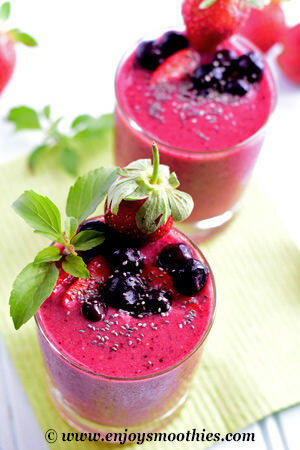 In a blender combine the raspberries, banana, pear, almond milk and chia seeds and pulse until smooth.